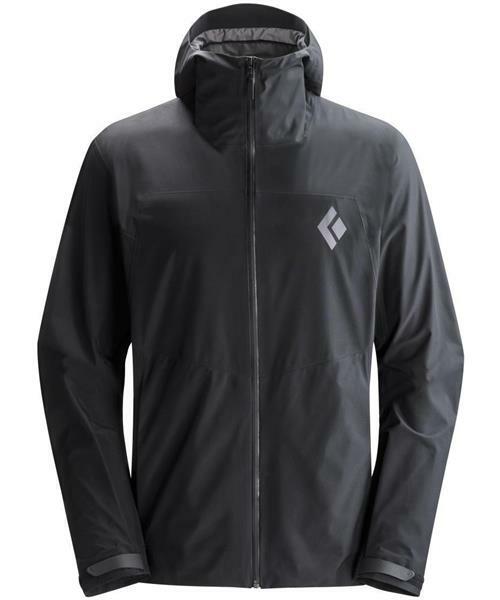 Designed to trim excess weight on backcountry trails and alpine faces, the Black Diamond Liquid Point Shell carries all of the features you expect from a Gore-Tex hardshell with minimal bulk and lightweight materials. Their full-featured Gore-Tex Paclite hardshell, the Liquid Point protects against unexpected alpine tempests and features hand pockets for storing small essentials and cold digits. The adjustable hood slides cleanly over a climbing helmet, and two-way armpit zip vents allow for quick temperature regulation during stormy, high-output days. The drawcord hem and custom-molded cuff tabs seal out intrusive moisture and cold wind when conditions get foul.